In this section, you update the configurations of both the BookCar and BookHotel intents by adding the Lambda function as a code hook for initialization/validation and fulfillment activities. Make sure you choose the $LATEST version of the intents because you can only update the $LATEST version of your Amazon Lex resources. 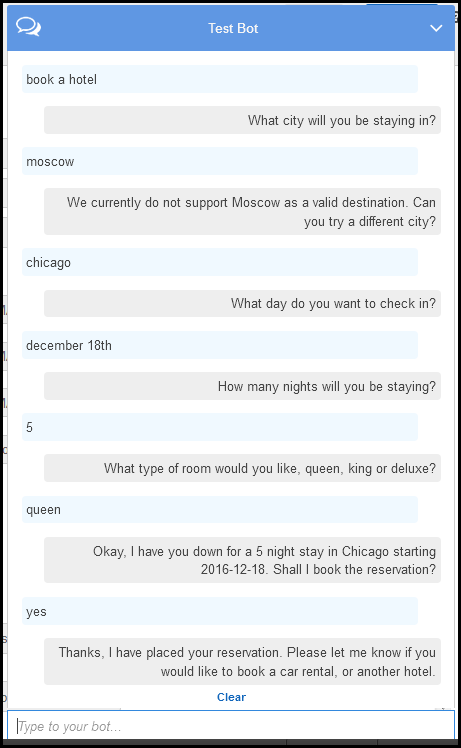 In the Amazon Lex console, choose the BookTrip bot. Make sure the intent version (next to the intent name) is $LATEST. In Options, choose Initialization and validation code hook. Choose your Lambda function from the list. In Fulfillment, choose AWS Lambda function. Choose Goodbye message and type a message. On the Editor tab, choose the BookCar intent. Follow the preceding step to add your Lambda function as validation and fulfillment code hook. Choose Build. The console sends a series of requests to Amazon Lex to save the configurations. Test the bot. Now that you a have a Lambda function performing the initialization, user data validation and fulfillment, you can see the difference in the user interaction. For more information about the data flow from the client (console) to Amazon Lex, and from Amazon Lex to the Lambda function, see Data Flow: Book Hotel Intent. 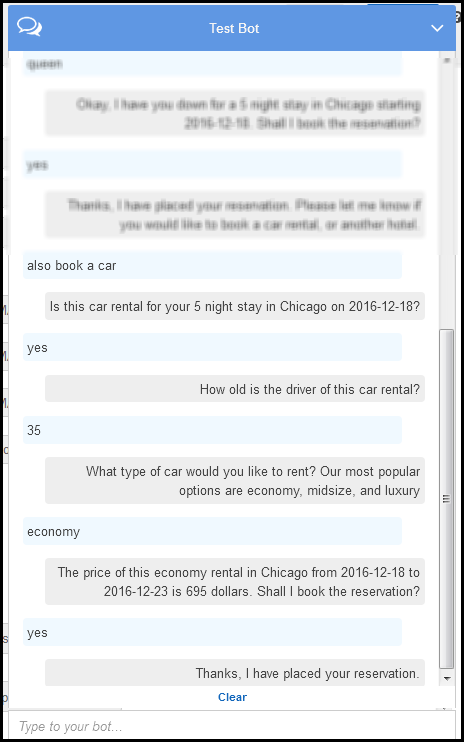 When you choose to book a car, the client (console) sends a request to Amazon Lex that includes the session attributes (from the previous conversation, BookHotel). Amazon Lex passes this information to the Lambda function, which then initializes (that is, it prepopulates) some of the BookCar slot data (that is, PickUpDate, ReturnDate, and PickUpCity). This illustrates how session attributes can be used to maintain context across intents. The console client provides the Clear link in the test window that a user can use to clear any prior session attributes. For more information about the data flow from the client (console) to Amazon Lex, and from Amazon Lex to the Lambda function, see Data Flow: Book Car Intent.